Edmonton is truly a winter city that sees its fair share of snow. And with the snowfalls, come Bylaw Enforcement Officers who look for uncleared ice and snow on sidewalks enforcing Community Standards Bylaw 14600. Why does the City enforce this bylaw? It’s not why you might think. Every year, hospitals and doctor’s offices are filled with those who have slipped and fallen on snow and ice left on sidewalks. People with limited mobility, the elderly, children, parents pushing strollers and everyday people, all have difficulties walking on snow and ice covered sidewalks. Uncleared walkways also make it difficult for people who deliver services in our city – mail carriers, meter readers, delivery drivers, firefighters and paramedics. These hazards are why the Community Standards Bylaw requires you clean the public sidewalks around your property by removing all ice and snow after a snowfall. In the interim, we encourage citizens to use sand or ice-melting products. Courtesy sand boxes can be found at many local community centres. Although these courtesy sand boxes are topped up regularly, often demand exceeds supply. When this occurs, we encourage citizens to buy sand or ice-melting products at their local department or hardware stores. This winter, if you know of a neighbour who might have difficulty removing snow and ice from their sidewalks, why not give them a helping hand and become their Snow Angel? 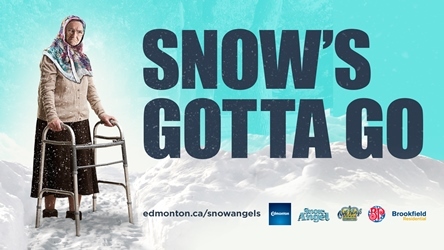 If you’ve had a volunteer shovel your walkways, get them their wings by nominating them as a City of Edmonton Snow Angel! If nominated, your volunteer could receive vouchers to see the Edmonton Oil Kings! www.edmonton.ca/snowangels. When you remove snow promptly after a snowfall, you play an important role in keeping our city moving safely in difficult weather. Be your neighbourhood’s urban hero!